Last year, the Wolf Administration announced PennDOT's Road MaP initiative, which will invest more than $2 billion in roadway maintenance and highway and bridge capital projects over the next 10 years. 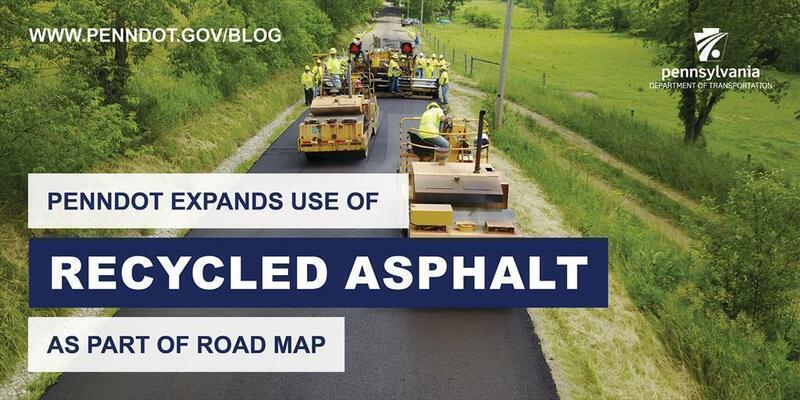 Half that money is allocated specifically toward county maintenance activities, which is allowing PennDOT's Hollidaysburg-based District 9 to expand the use of recycled asphalt pavement (RAP) materials in Blair and Cambria counties. RAP repurposes materials from projects onto other roadways by mixing ground millings with oil. It's an environmentally conscious method that saves the need to purchase new material and stretches our dollars so we can impact more miles of secondary roads. RAP has been used for quite some time in our northwest region, and it's estimated to have saved the region roughly $5.4 million annually. District 9's regional paving crew will use 10,300 tons of recycled asphalt materials to resurface about 1.5 miles of Route 2022 (Juniata Valley Road) in Blair County and 2.75 miles of Route 1002 (Winterset Road) in Cambria County. Additionally, Cambria County will extract 4,000 tons of aggregate to augment the 2018 Seal Coat program and Somerset County has planned an 8.5-mile full-depth reclamation project on Brush Creek Road (SR 2017). And districtwide, county maintenance forces will place crushed millings as shoulder backup for paving projects throughout the six-county district this construction season. Get updates on your local projects by finding your PennDOT district on www.penndot.gov. And follow us on social media — Facebook, Twitter, and Instagram​.